We would like to thank Dawn Faulkner and Dean Stroud for their very kind donation. We are so grateful to the very kind people who support us. Megan has once again organised a Dog First Aid Course. Those who went on the last one found it was brilliant, with lots of information, especially if you have an emergency and don't know what to do!! Bristol DAWG receive half of the proceeds from the evening, so not only would you pick up invaluable information, which could save your dog's life, but you would be helping the charity. Everyone receives a First Aid Kit which is brilliant - well worth the money alone. We obviously want to fill all the spaces so if you are interested please e-mail Megan (details below) - look forward to seeing you on the evening. We are absolutely delighted that Austin has found a new home with Christine, Simon and their beautiful boxer (Bella) in Bath. Apparently Bella and Austin love each other and spend hours playing. Another happy ending. This afternoon we had to say goodbye to our special boy, Ricky. It is probably one of the hardest things we have ever had to do. Over the last four weeks he has had numerous tests, x-rays, an MRI scan and a spinal tap, none of which indicated what was wrong. Today we went to the vets again for an ultrasound which revealed that he had a tumour between his bowel and bladder which was slowly bleeding into his abdomen. He has been such a brave boy these last four weeks, and didn't appear to be distressed or in pain (but we all know dogs hide pain well). We will miss our special lad so much as he was one of the nicest, gentlest, most polite dogs you could ever wish to meet. Run free at the bridge big boy - we will never forget you. Brilliant news - Teddy, our big brindle and white boy, has found his forever sofa with Suzy and Charlie. He went off to his new home on Saturday, he has been a really good lad, and they have already said they can't imagine life without him. Thank you so much for giving Teddy a wonderful new home. Our new boys and girls eventually made it over the Irish Sea last night after a short delay because of bad weather. Thank you to Kristie for getting up in the early hours to settle them in. 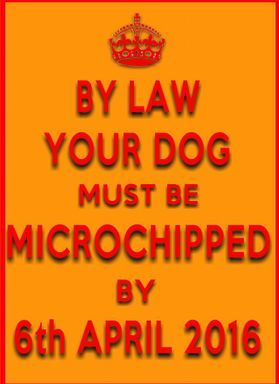 Keep watching for further details. The things people will do to raise funds for Bristol DAWG! Meet Dave Shorney (or Mother Christmas!! 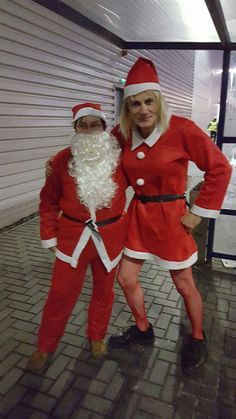 ), Dave works in a large distribution centre, working nights, his colleagues sponsored him to dress up over the festive season and work through the night - he assured me that at 3.00 am in the warehouse his tights weren't that warm!! 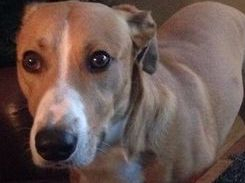 It has taken a little while to collect monies due to varying shift patterns, but Dave raised an amazing £249 - thank you so much Dave our hounds are truly grateful. Lovely picture I am sure you will all agree!! Thank you to all our wonderful supporters. A big thank you to my very good friend, Maxine Molton, for her very generous donation - you are a very kind lady. 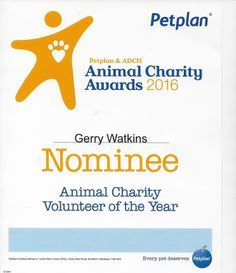 Congratulations to our hard working and super efficient secretary who has been nominated for the Petplan Animal Charity Volunteer of the Year. Wouldn't it be greyt if she won?! Good luck Gerry! 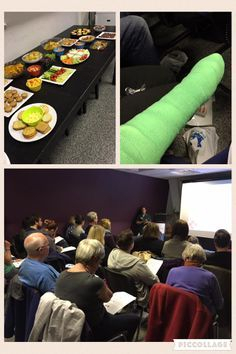 Thank you to everyone who attended the first aid course tonight. £120 raised for Bristol DAWG. Huge thank you to Gill Tooze for organising and to Amie for giving such a fabulous talk!! 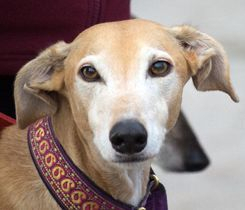 In less than a month Luna and Figura will be leaving Spain for new homes in the UK. They are leaving Spain on 13 th April and should be here by 15/16th depending on the route. We had fawn ones last time but this time brindles are the lucky ones. We would like to say a massive "thank you" to Jan Lasenby who very kindly attended a Craft Fayre and raised an amazing £79 for Bristol DAWG. Well done Jan you are very kind. More good news, Brandon has found his forever home in Weston-Super-Mare with Cora and Fergus. 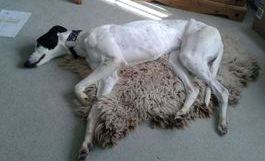 Brandon is probably the biggest greyhound that Bristol DAWG have ever rehomed, but he is also one of the gentlest. Being so big, we thought we would have trouble finding him a home, how wrong were we!! Just goes to show that smaller is not necessarily easier. He has been in his new home since Saturday and he has been such a good boy - in fact he hasn't put a paw wrong. Thank you to Cora and Fergus for giving Brandon a wonderful home. Massive thanks to the Committee of Christmas on the Hill for their donation of £50. Look forward to seeing you next year. We will this week be launching our next online dog show as a fundraiser for Bristol DAWG. The photos entered will all also go forward for the 2017 calendar. To help us raise as much money as possible for DAWG we are looking for kind companies or Individuals to sponsor a class. Perhaps in memory of a dog now at the bridge or to promote your company? The cost will be £5 per class (12 to choose from) and all businesses will get a link to their Facebook page or website. All individuals will have their name and who/why they are sponsoring the class for. Although the weather was not on their side yesterday and the wind and rain kept people away, our wonderful Wiltshire supporters, Dave, Lynne, Barbara and Ciaran, found an empty shop doorway for the dogs, Rudi, Marley, Karma and Spirit, and managed to collect £102.24p. People who met them were very interested in the dogs, DAWG and all the work everyone does to help the dogs find their forever homes. We would like to say a huge thank you to Michelle Smith and the team at Pets at Home VIP Charity for the amazing pallet of goodies which arrived today. On this pallet were hundreds of pounds worth of good quality dry and tinned food, toys, collars, leads, beds etc. When you are a small charity like Bristol DAWG, donations like this are invaluable. Thank you Michelle for helping us to help the dogs in our care. Thank you also Phil, Manager at Pets At Home, Bradley Stoke for storing the food for a couple of days whilst we found somewhere to keep it. Thank you Wendy for your latest generous donation, we are always most grateful for your support.